Nepalese government has always been disgrace towards it's people. They pass the budget and they don't put it to right use. They buy tons of computers and spend lots of country's money on it. And, they use it just for personal email and playing games during their "Raja ko Kaam , kahiley Jala Ghaam" time. They didn't put much concerns towards online security. 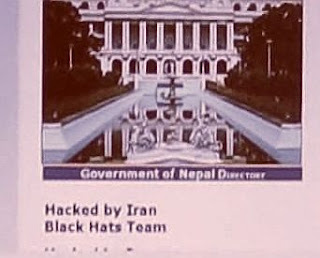 Yesterday, a very talented group(Wanter, Kinglet,$mart,!inf3rN.4Il,Echo) tagging themselves as Iranian BlackHat Team hacked www.nepalgov.gov.np. This group though very talented were fully motivated towards bad intentions, defacing every loophole websites they could find. Mostly big companies,government sites. Right now, may be some moron ministers and his cabinet members or office fellows must be amusing on this incident. For them, it must have been a good subject of gossip for whole day. damn them!!! After sometime, all the contents wiped out and they put stuff like this. Fully owned by them!!! And, now the site is totally nulled. Government must have no database at all(this shows how careless are they), most probably, else they would have already uploaded the content. Or, may be they have not yet regained the control from the hackers. Shocking. And by the way where is you’re robot? deepa, you've to click read more to see my embedded video or may be script is disabled on your browser which is not allowing you to view my video content. anon, thanks for the referal. and yeah, i saw that video. atomicfire, yeah.. it is indeed and i know how sluggish they are acting now,.. may be trying to hire some expert admin.. however sooner or later, something serious must have dawned on them. they should always be serious about online security. When i was in nepal, i know how easily they ditch the topics on technology and online security. World is keeping pace with this innovative new technology and they're just in the start struggling with how to regain control of their own space. damn them..
please keep posting your invaluable suggestions. let your voices be heard too..
Yeah its a shame. But anyways, its Nepal, security is not much a concern. Security on websites? what do you think? Time for my opinion for the attack. You call them talented hackers, I call them f*cking lame idiots. All they did was change the index page and put their so-called 'elite' flag on the already backward country's site were IT is as low as low can get. The site(being a Nepal Government's property) probably used the oldest unpatched version of linux/apache/or_whatever_software_it_used whose exploits are freely found over the internet. And do you think the sysadmins(if they exist) care? Nonetheless IBH did that for their 15 minutes of fame?? NOW THAT IS LAME. The statement 'Defacing a website is hacking' is as true as saying 'Hotwiring a car is engineering'. And hotwiring a Nepelese government owned vehicle that can hardly run on it's four wheels is f*cking lame. binay! liked your comments. true hackers would never do that but there are other genre too. "BLACK HATS".. what do you say about em. These are geared not for short fame but for money. They hijack a site, and ask ransom to get the content back. I'm not sure about their intention but i've found not much but some info on them and they are real talented people from IRAN. They are not even script-kiddie or wannabe as you might think. but the only thing what riddles me most is why they do it? are they cyber terrorist? i dunno..
it's just like you can create bomb to kill people instead of blasting rocks and create a way. It's just a misuse of knowledge. 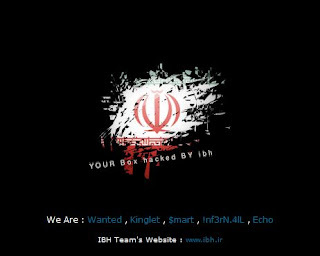 and, defacing a website is of course a work of hacking, a different cult known as Black Hat . I'm not being sympathetic to em but it's just a way they are doing which disgusts me after all. and you are right. must be too easy for them to hack our country's site. It's needless to write, they didn't mention it's name anywhere on their site. might have thought,"too easy, prey, useless to mention". thanks to google. once again. Finally the site is up!!! firefox for some strange reasons is not rendering the links properly in the comments. So Nepalese government will start checking who was the Hacker dare to hack into government site!! Its very serious, looks like Iranian are not satisfied Nepalese government's services? How does the digg effect feel like bro? Nepal's All things have been hacked,(no security,no job, no petrol, no sim,yes sim-no service,no human rights, no CA election etccccccccc.........)so hacking of site is just a small incident.. isn't it???? merdurian, it's not like that. it's just they are showing they do exist and showing supremacy of their knowledge..creating havoc.. everywhere, not only ours country's site. Aakar, you are somewhat true bro.. with your descriptions, anarchy is imminent. hahaha, okie Anonymous, but how would they hack Holy figure and what upgrade were you talking about?? anyways, keep checking in. नेपाल मन्त्रालयको site मा नग्न साईट हरुको लिंक तथा फोटो ..
कसैलाई यस बारेमा सोच्ने फुर्सद भए पो ?